The final chapter presents ‘actual applications’ of the Ishango rods: what can still be seen at present about the topics covered in this book? And what is their importance for current education or research? A visit to the Africa Museum of Tervuren shows many of its objects can also be seen from a mathematical point of view, while examples of classroom quizzes of different levels on African mathematics illustrate how some topics could immediately be used by teachers. 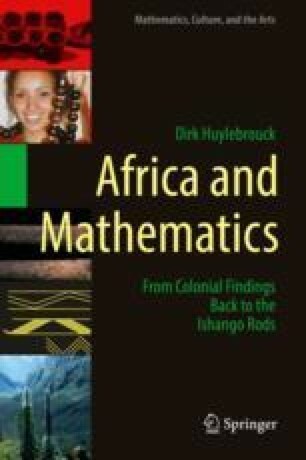 Some research studies rely on more specialized mathematics, but they will hopefully lead to more respect for these African mathematics and convince even the most sceptical minds.